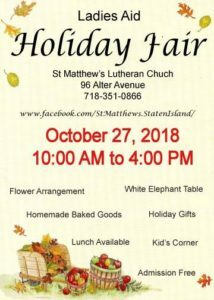 Sunday School Alumni | Welcome to St. Matthew’s Lutheran Church on Staten Island, New York. In the Summer of 2012, two Sunday School Alumni, Deanna and Karin, wanted to help out their church in any sort of way. Their current goal is to raise money to refinish the fellowship floors – goal is $2000.